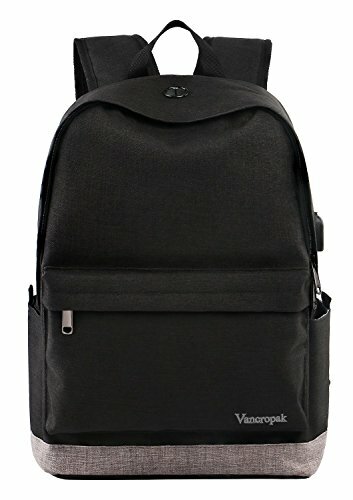 Student Backpack, School Backpack for Laptop, Unisex College Bookbag Back Bag with USB Charging Port, Fits 15.6 inch Laptop, Travel Water-resistant High School Rucksack for Men/Women, Boys/Girls | Replicafer Co.
- A great gift of Father's day, Mother's day, Christmas day, Thanksgiving Day, Black Friday. We always adhere to the concept of development: Innovation, Diversification, Sustainable Development. If you have any issue, please do not hesitate to contact us, we will contact with you within 24 hrs. MULTIFUNCTIONAL STRUCTURE: The thin laptop backpack for student is ingenious with a total of 6 pockets and 5 small organizes. 1 small inner zipper organize, 4 small open inner organizes.Besides there are 1 main zipper pocket, 1 front zipped pocket, 1 strap pocket, 2 sides pockets, and 1 laptop compartment pocket for your Laptop, such as for Dell HP, Asus, Lenovo, Toshiba, Acer, Fujistu, Samsung, Sony, MacBook, Notebook, and for iPhone, iPad, pen, keys, wallet, books, clothes,bottle and more. PRODUCT SIZE: External dimensions: 17×13×5.5 inch(L×W×H); Capacity: 8.7L (fits up to 15.6 inch Laptop). If you have any questions about this product by Vancropak, contact us by completing and submitting the form below. If you are looking for a specif part number, please include it with your message.